This is Orly Sweet Peacock from the 2011 Birds of a Feather Collection. When I won a giveaway on Polish & Such, Amy noticed Sweet Peacock on my wish list and added it to my prize pack. Now that's going above and beyond! That's all for today. Have a great Friday everyone! This is so beautiful Every time I see swatches of it I always wonder why I never bought it. I know. I always picked it up in the store and put it back. I'm so glad I got it finally! 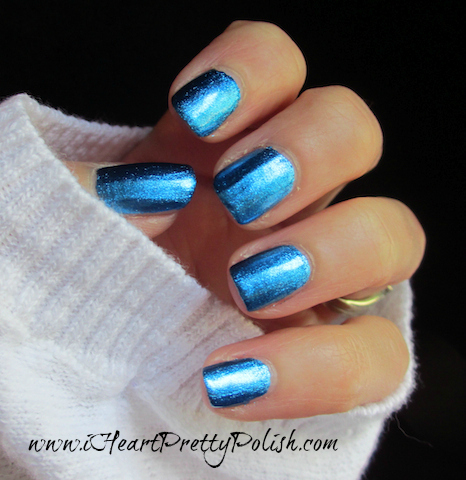 Hell, you're never too old to wear this beautiful polish!!! This is my top 5, I absolutely adore it and whenever I wear it I gawk at it all day!! It looks stunning on you Essie!!! Well good, glad you agree:) Thanks! This is one absolutely stunning blue! I love it!! Yes, it is a really cool blue! I Love this color and you can never be too old to express yourself with color! Looks great with the contrast of a white shirt too! I love coordinating like that. Yes, it does stand out with the white! I love Sweet Peacock! It looks beautiful on you and is especially stunning with your white sweater!! What a perfect "frosty" winter combo. I will have to remember that in a few months!